The harassment of Kate Middleton by photographers is akin to that of Princess Diana, former royal press secretary Dickie Arbiter has said. And Prince William's spokesman said the prince wanted the harassment of his girlfriend by the paparazzi to end. As speculation mounts about a royal engagement, her 25th birthday saw a media scrum outside her house. The Sun, Times, Sunday Times and News of the World have vowed not to use paparazzi photos of Miss Middleton. A spokesman for William said: "We are pleased that News International has agreed to stop using the paparazzi pictures. "What Prince William wants more than anything is for the paparazzi to stop harassing her." Mr Arbiter said the media's treatment of Prince William's girlfriend showed they had learned no lessons. Mr Arbiter said: "What is happening outside her home at the moment is totally unreasonable. "A similar thing happened to Diana, Princess of Wales, at the time of her engagement and here we are so many years on and exactly the same thing is happening. They haven't learned a lesson." 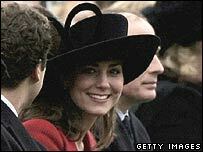 In 2005, Miss Middleton's lawyers contacted newspaper editors to ask the press to leave her and her family alone. They argued that photographers had followed her almost every day and night since she had left university. Publicist Max Clifford said the treatment of Miss Middleton did constitute harassment, but counselled against confronting the press. Mr Clifford said negotiations with the Press Complaints Commission and newspaper editors, as happened over coverage of Prince William and Prince Harry at university, would yield better results than "high-risk" court action. The voluntary Press Complaints Code says: "It is unacceptable to photograph individuals in private places without their consent. Private places are public or private property where there is a reasonable expectation of privacy." Many of those who have fallen foul of the paparazzi have said the code offers too much freedom to the media. The code also has an entry on harassment, which says: "Journalists must not engage in intimidation, harassment or persistent pursuit. "They must not persist in questioning, telephoning, pursuing or photographing individuals once asked to desist." 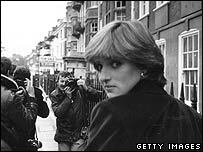 Attempts to take action against paparazzi and the media using the Human Rights Act have had mixed results. A spokeswoman for News International confirmed that the ban was in place, related to Miss Middleton only, and was initiated by the company's chairman.